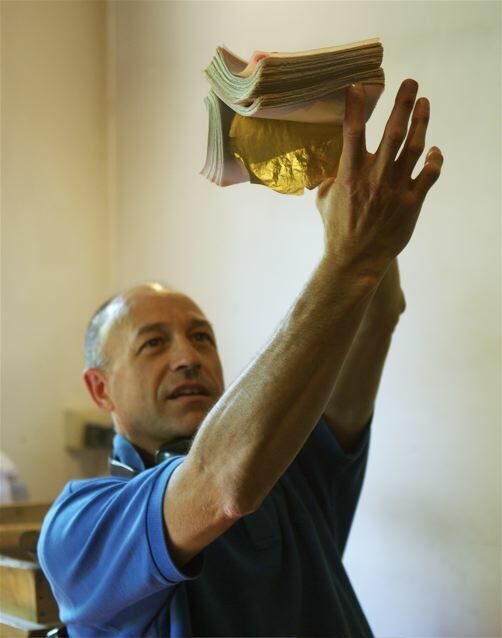 One of the most peculiar workshop in Venice, where you can learn and see how gold ingots are transformed into thin foils for different applications. Gold is the most precious material, and it has multiple uses! Visit a family of Venetian goldsmiths who have been decorating the famous ornate gondolas with gold leaf for generations! In Venice, the gondola is a revered part of Venetian culture! Let us introduce you to the Battileros, a famous family of goldsmiths, who for almost a hundred years, have been responsible for adorning the gondola trappings with gold leaf. Mario Berta Battiloro opened his workshop in 1969, wanting to carry on the ancient family craft begun in 1926. 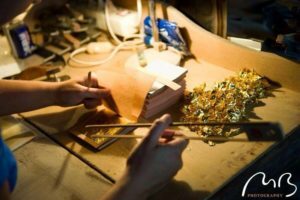 In this historic craft workshop of gold, silver and other precious metals you will observe the transformation process of gold into very thin leaves, which can be used for a number of things. What do the Battiloros do? In the Battiloro workshop they create gold leaf using a manual process which retains the integrity of the raw material. The family are dedicated to maintaining the quality of the gold leaf they produce and you can experience this dedication yourself when you visit this unique and mysterious world. Click here to learn more about the construction of the gondola! The production of high quality gold and silver leaf, sometimes combined with other metals, are what the Battiloro goldsmiths are known for. These paper thin leaves created with varying thickness formats and colours are used by a range of artists such as mosaic makers, glaziers, glass bead makers (perleri) restorers, guilders, iconographers, calligraphers, painters and sculptors! Used with different application techniques they can add an incredible richness and quality to the finished product. Since ancient times the, great versatility of gold, once suitably processed, would make it attractive even for decorating food and drink during very important occasions. The 24Kt gold leaf can be processed today to obtain an edible food decoration certification. Such purity guarantees top level quality standards and permits chefs, patisserie masters, wine experts and barmen to create a very special gastronomic result. Recent research has demonstrated the anti-aging properties of gold, when applied to the skin. If applied within a suitable carrier it can penetrate deeply, filling out wrinkles, reducing eye-bags, neutralising spots and creating a peerless sheen to the complexion. Gold in the cosmetic field may also be used to decorate one’s body. It can adorn, nails, lips and eyelids receive to create a special aesthetic beauty. Thanks to the custom-researched products made by MBB for beauty parlours and SPAs, everyone nowadays can experience the special properties of gold enjoyed by past civilisations such as the ancient Egyptians, the Maya and the Aztec. Forcolaio: the job of building the oars! Should you come with a stroller, please leave it in the entrance and keep the child in your arms. The studio is small and there are lots of tools. You will have to pay a down payment of 4.5 EUR/pers. online; the rest of the amount has to be paid directly on site, in cash. If you would like to go to this this experience and want to join a group, do not hesitate to contact us. You will have to pay a down payment 4.5 EUR/pers. online; the rest of the amount has to be paid directly on site, in cash. Every day, except on Saturdays and Sundays. Should you cancel the experience, a 10% fee will be withhold. There will be no refund in case of a NO SHOW, i.e. not attending the experience at the time and place agreed for the experience to be carried out.